FESTIVE DEL—Nothing says happy holidays more than a trip to the Hotel Del Coronado to check out the giant lobby tree and/or “do” brunch. 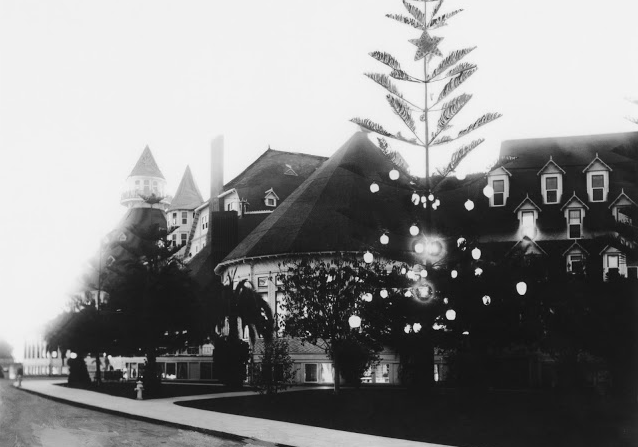 The vintage shot posted here was taken in 1904 when the hotel staff installed Tom Edison's new fangled electric lights on a nearby tree. Little did they know what they started as a recent photo of the venerable (1888) inn shows. Image: Recent: Phyllis Shess; Vintage: San Diego Home/Garden Lifestyles magazine via San Diego History Center.